A central theme in differential geometry is the existence and classification of “optimal geometric” structures. An important class of optimal metrics in Riemannian geometry are the Einstein metrics, especially metrics with special holonomy. These include in particular the Calabi-Yau and more generally the Kaehler-Einstein metrics, the study of which is by now a classical area of research at the intersection of geometric analysis and algebraic geometry. 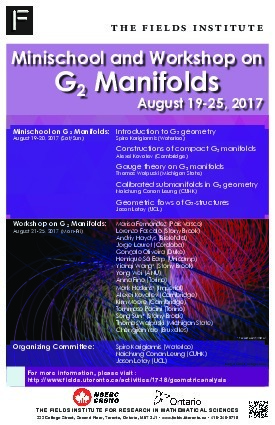 More recently, there has been increasing interest in G2 manifolds and other Riemannian manifolds with special geometric structures (such as Spin(7) manifolds or nearly Kaehler manifolds) whose study are not amenable to classical tools of algebraic geometry. This is partly due to the fact that all of these manifolds play important roles as ingredients for compactifications in string theory and M-theory. The area began to really develop in the 1980’s and 1990’s with the pioneering work of Bryant, Salamon, Joyce, Kovalev, Hitchin, and others. It is now one of the most exciting new frontiers in geometric analysis. Some of the key objectives include constructing new complete and compact examples (both by elliptic glueing methods and by parabolic flow techniques); finding topological invariants and obstructions to existence; and understanding the local and global structure of the moduli spaces of such structures.